A stack of these will definitely cure the winter blues. February. I don’t know about you but by this time of year I’m ready for sunshine and rainbows again. Nothing cheers me up more than a bag of citrus. Oranges, grapefruits, tangerines, blood oranges and of course lemons are in abundance right now. I truly think they are intended for our long winter months just to brighten our day. What better way to use them than in cookie form? I also think that by this time in winter, we’ve consumed a few extra pounds munching on snacks and drinking wine, that summer bod is a long, long way away. So why not snack on another cookie? Am I right? With 3 kids and a husband, cookies disappear pretty fast around here. My oldest daughter has an egg allergy and cookies are one of the toughest desserts for her to have. I am always looking for new ways to create eggless cookies for her to enjoy. You won’t be able to keep these for long! 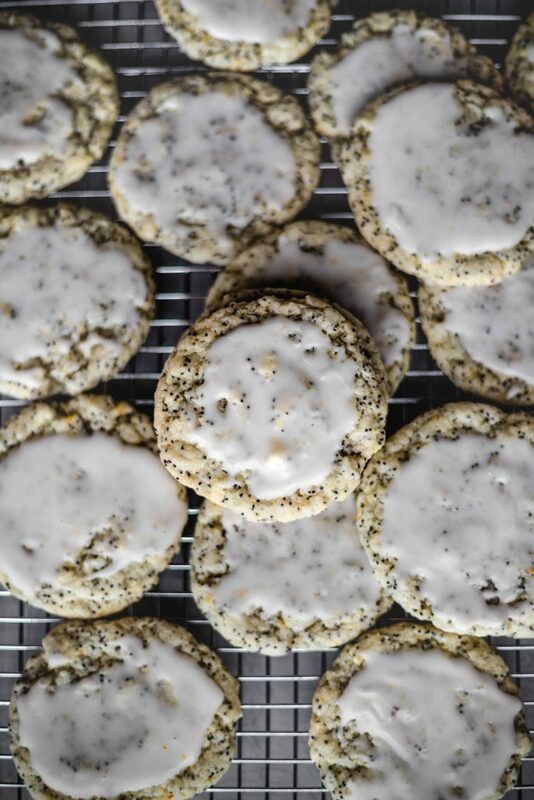 I bring you these Lemon Poppy Seed Cookies, and just by chance they also happen to be vegan so it’s a win for everyone (except those of you who are gluten free, sorry). 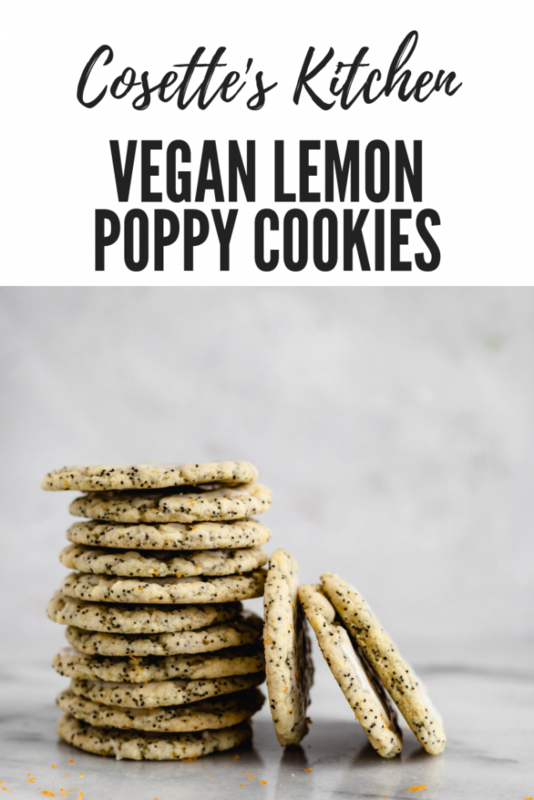 Bright lemon flavor, bits of poppy seeds and the glaze, ohhhhhhh the glaze is what makes these perfect! 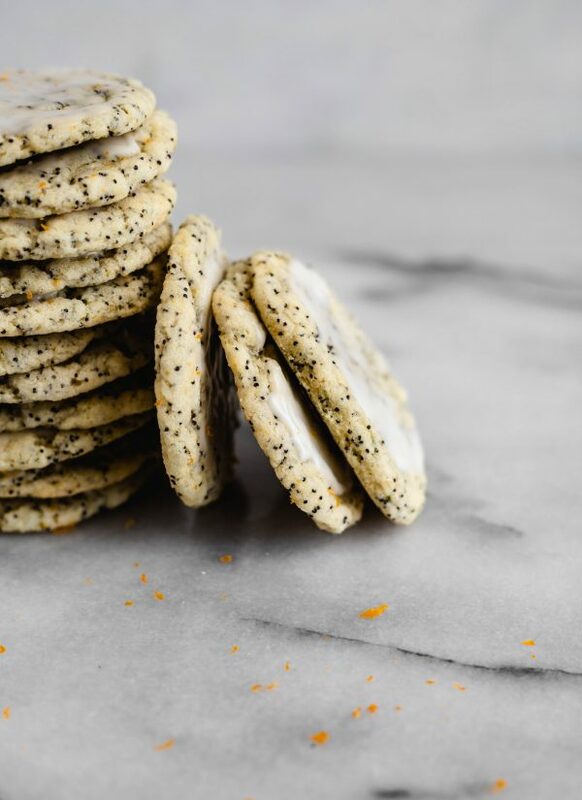 A soft and chewy cookie with the ever so slight crisp edges. I love a good chocolate chip cookie but really these are wayyyyyy more my style. Oh, and did I mention…one bowl and NO MIXER! Okay, I got you hooked now!!! If you are anywhere in the Pacific Northwest this weekend, I’m pretty sure these will be a necessity. As always, I love seeing your creations. Please be sure to tag me on Instagram or Facebook, I love to share your recreations in my stories. And don’t forget to Pin for later! In a large bowl, combine your flour, baking powder, baking soda, salt, poppy seeds and sugar. Whisk to combine. Make a well in the center of your flour mixture and add your oil, water, lemon juice, vanilla and zest. Mix well and stir until a cohesive dough forms. Place mixture in the fridge for an hour, or longer The refrigeration helps the cookies not to spread while baking. Preheat oven to 375F degrees. Prepare 2 baking sheets with parchment or silicone mats. Once your dough has chilled and your oven is preheated, using a cookie scoop, scoop your dough and slightly flatten each cookie. Fill each cookie sheet with 12 cookies, leaving about 1.5" between each cookie as they will spread. Keep your second sheet in the fridge while you bake your first one. Bake for 10 minutes, remove and let cool before adding glaze. Add your 2nd sheet and repeat. Prepare glaze by mixing powdered sugar and lemon juice together until a thick glaze forms. Glaze cookies once completely cool. Store in an airtight container for a week. Enjoy!